This Thursday, May 1st, at 7:30pm, poets Alicia Ostriker, a major American poet and critic, and author of eleven volumes of poetry, including The Volcano Sequence and No Heaven, and Frannie Lindsay, whose newest volume of poetry, Lamb, was selected for the Perugia Press Award, will read from their most recent work at Mocha Maya’s Coffee House, 47 Bridge Street, Shelburne Falls, MA. Frannie Lindsay is the author of Lamb, winner of the 2006 Perugia Press Prize and runner-up for the James Laughlin Award of the Academy of American Poets. Ellen Bass calls these poems “hymns of praise for the love we are able to wrest from our flawed lives.” Her first volume, Where She Always Was (Utah State University Press, 2004), was selected by J.D. McClatchy as the winner of the May Swenson Award. Lindsay holds an MFA from the Iowa Writers’ Workshop, has been awarded fellowships from the National Endowment for the Arts and the Massachusetts Cultural Council, and is also a classical pianist. Funny how a crisis robs you of time. Now it’s Saturday, and I’ve not written another poem, and I am far far behind. My personal goal is 15 poems for the month, so I have time. I shan’t give up! and lastly, my contributor’s copy of the spring 2008 issue of Iodine Poetry Journal. All Hail to the Household Gods of Mail! In which Marie has a bit of a bad day and discovers the secret of life. There was a ginormous earth-shattering fireball-spewing thunderstorm in Amherst last night. I know this not because I was there, no, we had a small sibling storm in Shelburne Falls. No, I know this from hearsay and because when I went into the bookshop at 7:30 this morning, not a single computer worked. Let me say that again. NOT A SINGLE COMPUTER WORKED. After much fiddling with wires and unplugging and plugging of cables, I managed to get our main computer up and running. And then I fixed the computer at our primary register, halleluiah, we’re not completely crippled. But all of the other 5 are just blinking away. I spent many many minutes on the phone with tech support — we’ve decided that the stargate (I just love that we have a piece of hardware with that appellation!) is fried, and they’re sending a new one with a chip that I have to install in the primary computer’s guts somewhere, and so my tomorrow morning is sure to be equally taxing. But here is the point: the secret to life: Pay attention. That’s the secret to writing, too, I think. Because somehow I’ve become known as the computer tech person on staff here. I’m not especially handy. At all. But I read the manual for our particular inventory management program. And I’ve paid attention. And the first rule of thumb before you call tech support is fiddle with wires, unplug & replug all the cables, etc. Because if you don’t, they’re going to tell you to do it anyway, and if by some miracle it does fix your problem, you’re going to feel like a big schmuck. I like to start every conversation with tech support with a laundry list of everything I’ve already done to try to amend the problem. It makes me feel really good, they’re so appreciative. There are other problems, but never mind for now. I’m drinking a sweet frozen strawberry drink from a local coffeehouse, ahhh. I will return to the store, immerse myself in more returns, mindless manual labor, and try to devote some brain capacity to poem-thinking. Last night I went to hear Gabriel Fried read at Amherst College. I really like his book, Making the New Lamb Take (Sarabande Books, 2007), so I was excited to go, though exceptionally tired. I’m glad I exerted the effort. He’s very sweet, and his reading style conversational. And he has the most amazing head of red hair! Totally unexpected. I don’t know why, but there’s something very disarming about a red-haired man. Maybe because usually it’s genuine. And his is very red, that rare kind of red, not merely strawberry. Many poems in his collection deal with Biblical themes, and it was surreal to watch him read one of my favorite poems, “Abel, after,” which imagines Abel reborn as a lamb in Cain’s flock, while Gabriel’s head glowed in the spotlight, haloed in fire. Revisions were indeed the focus this weekend. My output hasn’t been as great as many of the folks participating in NaPoWriMo, but I’m happy to say that I’m pretty pleased with everything I’ve written. Hubris maybe, or just infatuation with my new loves, but right now, yeah. 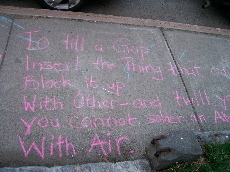 Get your sidewalk chalk and pick your poem and get to it. You only have until April 30 to get your free book from Sarabande! Grilled Cheese with Bacon & Tomato kind of Night. No poem today. Not even a revision. Back to work where my inbox was filled with nearly 600 emails and my tangible box was just full. But what a glorious day! 80 degrees! On April 18! This evening Vincent & Lance went for a walk downtown while I started making the season’s first batch of sweet tea (! ), and then Vincent & I went out again because he couldn’t get enough of outside. We ate a lovely dinner of grilled cheeses (Mama’s with bacon & tomato) at the Foxtowne Diner, and then we went to the pharmacy where I thought he’d like to sit on a stool at the fountain and eat a chocolate sundae, but he was more interested in the toys. I bought a pack of sidewalk chalk in preparation for the poem we’re going to write on the sidewalk. Now we have to choose the poem, and then choose the free book we want from Sarabande. And of course not forget to take a picture.